Gerard, John. 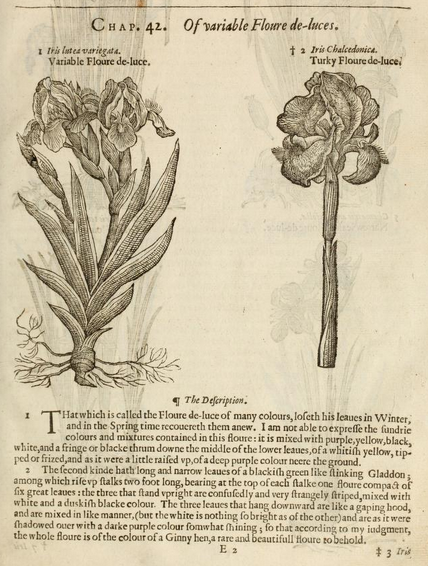 The herball or generall historie of plantes, gathered by John Gerarde of London master in chirurgerie, very much enlarged and amended by Thomas Johnson, citizen and apothecarie of London. London: Adam Islip, Joice Norton, and Richard Whitakers, 1636. Provenance: Morris (purchased for £3 10s.). — Richard Bennett. — Sotheby 1898, lot 545 (sold to Quaritch for £6). — Bernard Quaritch. — Wilfrid Scawen Blunt. — Sydney Cockerell (gift from Blunt, Christmas, 1906). — Cockerell sale, Sotheby, 10 December 1956, lot 115 (sold to William Morris Gallery). — William Morris Gallery (K776). References: Ellis valuation, fol. 49b (£4). — ESTC (S122175). — MS catalogue (1), fol. 16. — MS catalogue (2), unnumbered sequence. Digital versions: EEBO. — Internet Archive.